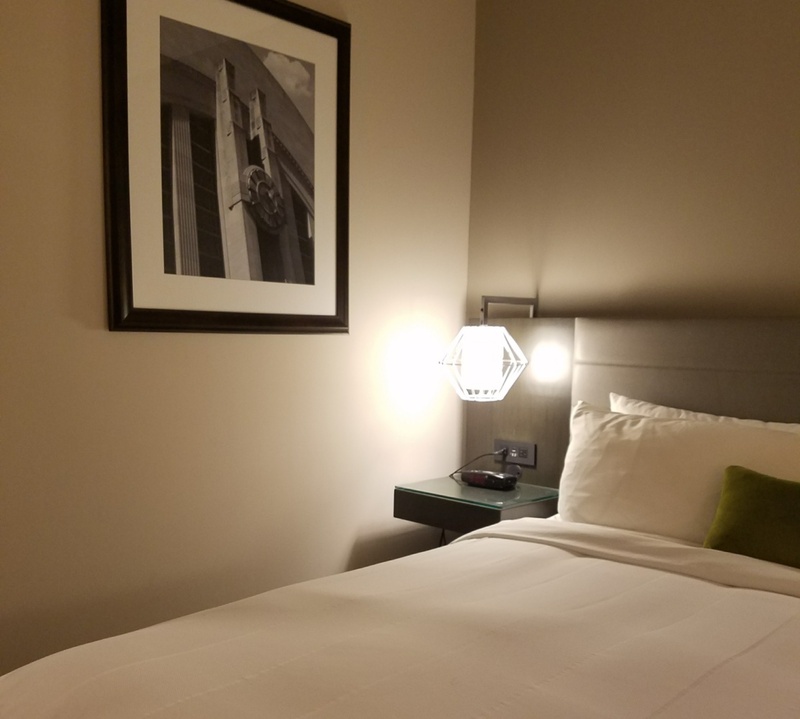 Full disclosure – this week’s hotel is another one of my favorites. I’ve eaten there, I’ve slept there, I’ve drank there, I’ve been a meeting attendee there, and I’ve worked there. In every instance, they never cease to amaze me. 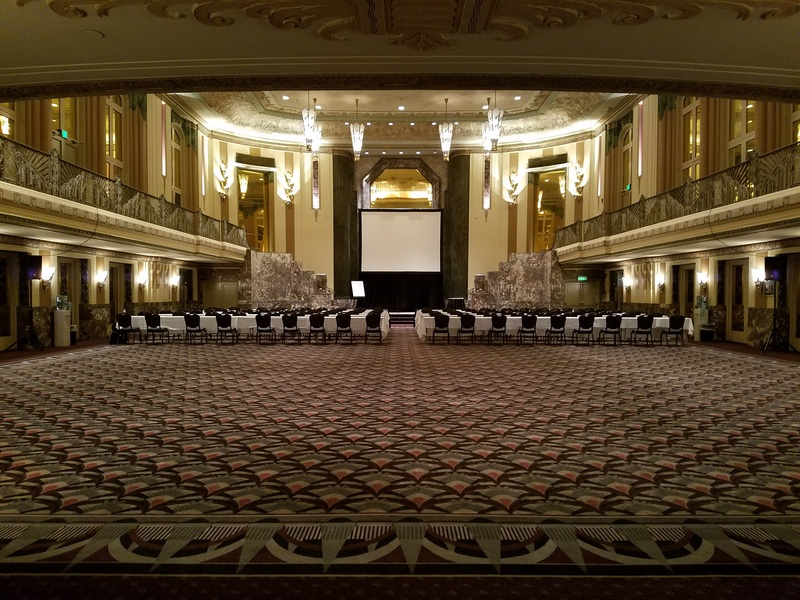 This week, I’m taking you inside the Hilton Cincinnati Netherland Plaza (HNP). 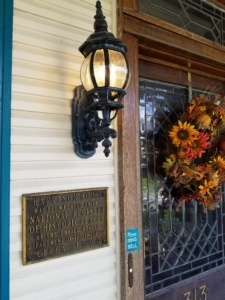 Grandly situated on the corner of 5th & Race in downtown Cincinnati, the HNP has sat for 85 years. It is one of Cincinnati’s (and Ohio’s!) oldest hotels. I think the team at the HNP would appreciate that I’m actually going to kick this post off talking about the food. ceiling. 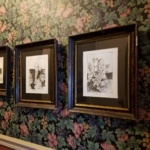 The hotel, and more specifically Orchids, has an interesting history. Would you believe some, pardon me, idiot covered that up in the 60s? That’s OK, there were lots of questionable design decisions in the 60s. 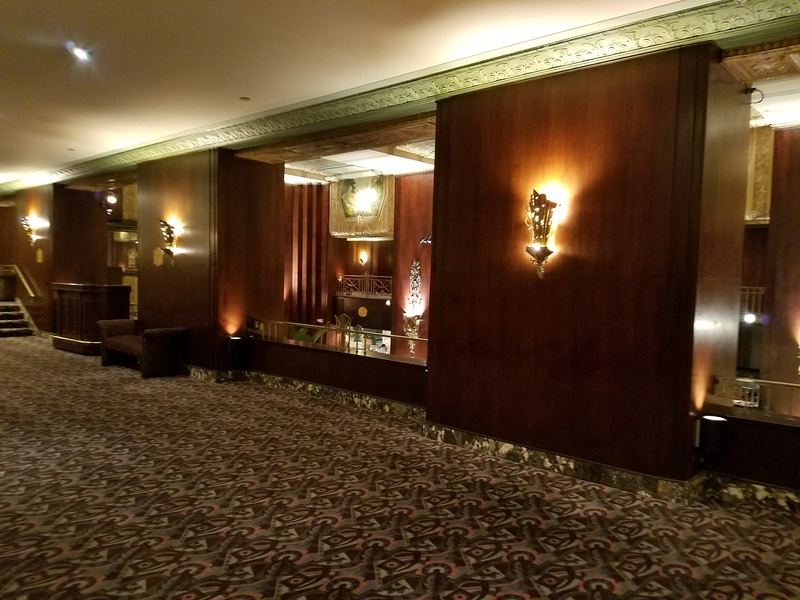 When the hotel underwent a 2 year, multi-million dollar renovation in the 80s, the paint was scraped from the woodwork, the murals restored and the original marble uncovered. What you see now is very similar to the original hotel design, classic art deco elegance (You can read more about the hotel’s history here. When you work there, you know these things!). 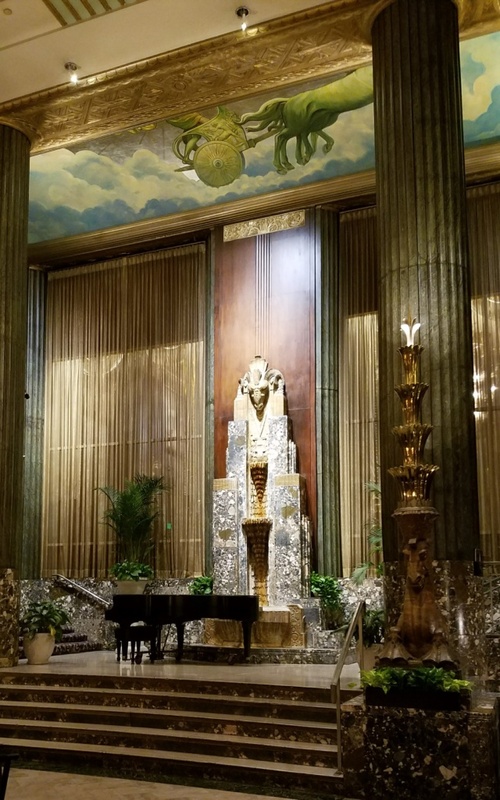 Speaking of elegance, the entire hotel is a walking museum and it’s gorgeous. You can quite literally get lost wondering the hallways. Actually, back when I worked there, you could ask the desk (or anyone with a uniform on) for a walking history guide (highly recommended!). So let’s start with the entrance. 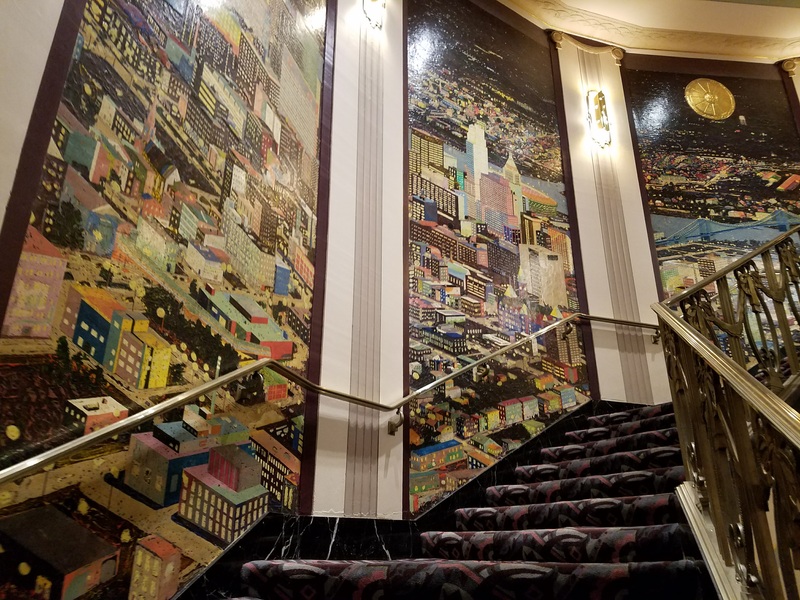 If you enter the hotel from the doors on 5th or Race you’re greeted by a sweeping, marble staircase that ascends to the lobby. 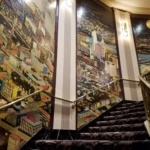 There are elevators, of course, but take the stairs – they are part of the experience. 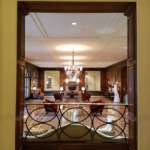 You’ll notice Orchids and the Grille at Palm Court off to your right. If you have a chance to eat here, do it. It is so worth it. Just passed the Grille, it’s hard not to notice the beautiful wall fountain. If memory serves me right, this fountain was a contribution by another historic Cincinnati business, Rookwood Pottery! 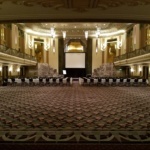 Just behind that is a long room that runs East to West along 5th St, this is the Continental Ballroom. If you close your eyes, you can imagine the ice skating rink! 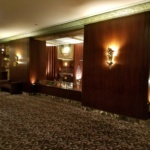 Take the stairs to the right of the Continental Ballroom. When you come out of this hallway, you might notice all of the wood on the walls. I think this section of the hotel is the best representation of the Brazilian Rosewood. These trees are endangered, so you better believe the staff takes really good care of the walls, they aren’t easy to replace. from a wedding ceremony to a formal reception in less than 2 hours. There were tables rolling and linens flying, but this team at the HNP has this down to a science. There is a ton of history and many famous people that have set foot in this room, and plenty of ghost stories. 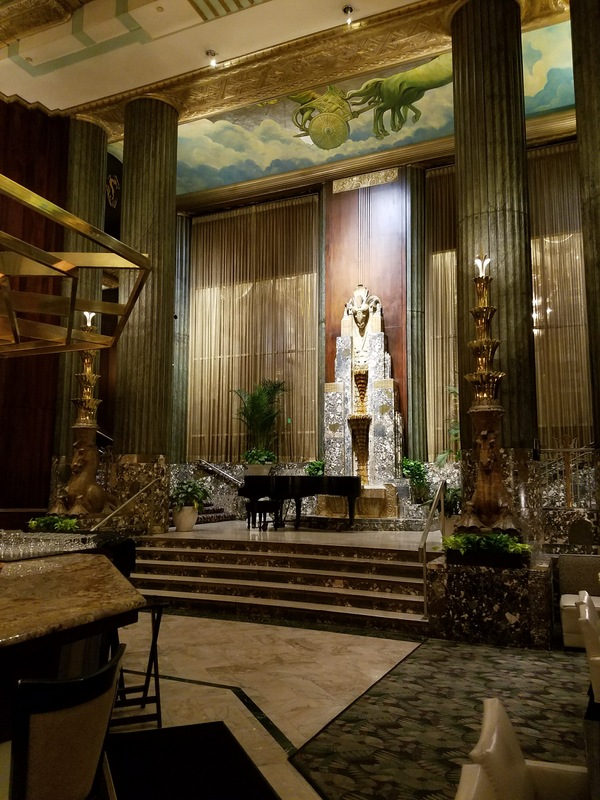 If you ask the right people, you might learn about The Lady in Green, a famed ghost of the hotel who is still searching for her husband who was killed during the construction of the hotel. In the time I worked there, I never saw her, but some swear by it! electricity goes out, you can follow the glow from the windows in this painting – it glows in the dark! You know, whenever I’m at the Hilton, I always walk around, hoping to discover something new. My trip this time was a whirlwind, in and and out in about 12 hours. 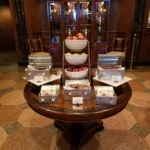 While I was there, I was able to enjoy a perfectly set meeting, a good breakfast and excellent service. One thing that continues to amaze me is the retention at this property. The hospitality industry is notorious for turnover, but the HNP has many of the same managers from 8 years ago when I was there and a lot of the same staff. Kudos to them, because their dedication to staff shines through in how they treat their guests. So, you’ve walked around the hotel, but you certainly haven’t burned off that exceptional meal at Orchids. If you’re like me, and you need a little more out of your day, hit the streets. Cincinnati is by far one of the most walkable cities I’ve ever visited and walk you should. I woke up that morning and ran, what I call, “the bridges.” It’s a great 3 mile loop from the hotel which takes you into Kentucky and back. If you take a moment to look over your shoulder, you’ll see the Queen City in all of its glory. If you haven’t noticed, I travel a lot. Not just for work, in my personal life too. I love it, so that’s good, but in 2016 we had 6 weddings to attend, two are out of state. This year, I got to attend my first ever beach wedding in Myrtle Beach, SC. Now, you might be able to guess this, but I’m not a huge fan of the big touristy destinations. I don’t know, something about the flash of Myrtle Beach doesn’t scream relaxing weekend away to me. But! Never fear, I was determined to find something unique on our trip and I found it. My family has made the trek to the North Carolina border for 29 years. 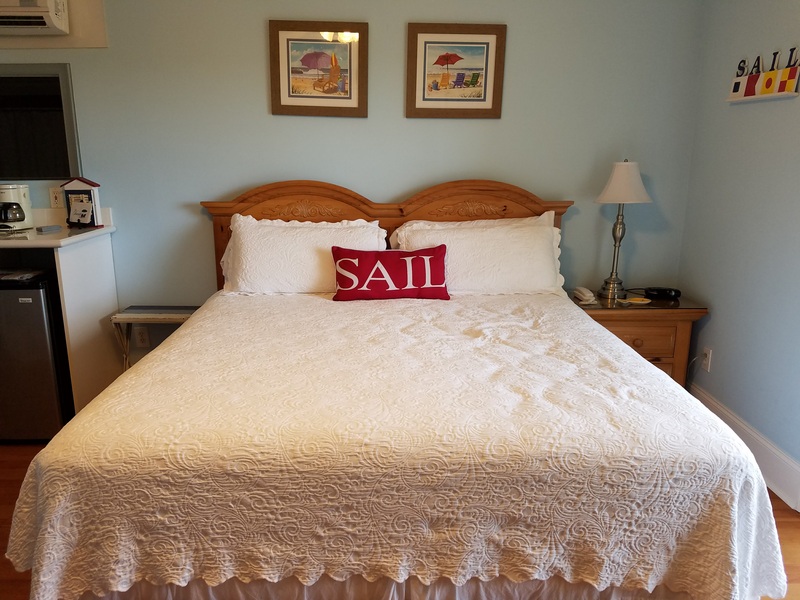 We stay in an ocean front house every year, so we are never looking for lodging accommodations – we know where we’re headed. 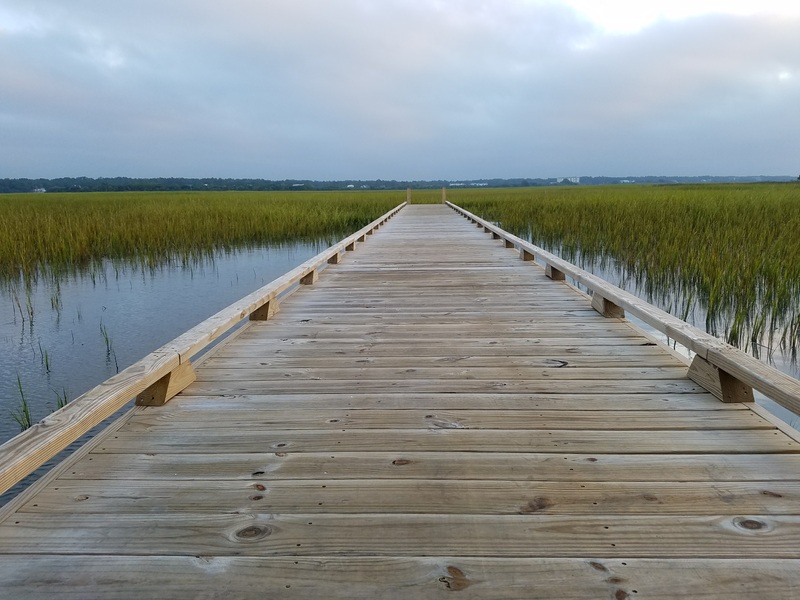 When we heard this wedding was going to be in Myrtle Beach, just 50 minutes from our annual summer vacay spot, we thought we’d take that opportunity to see what was around. I quick Google search of inns brought me to a love I didn’t know existed… The Sunset Inn. 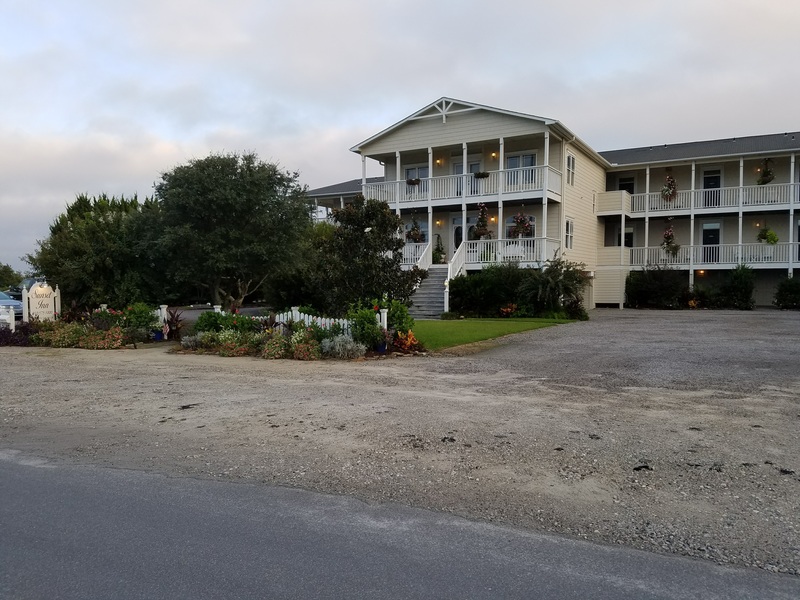 The Sunset Inn is located on Sunset Beach, NC an island nestled between Ocean Isle Beach and the border of North & South Carolina. It’s an island I’ve gone to a number of times, but I never knew this little gem existed. How fortunate we were for this opportunity. The book process alone made my heart flutter. 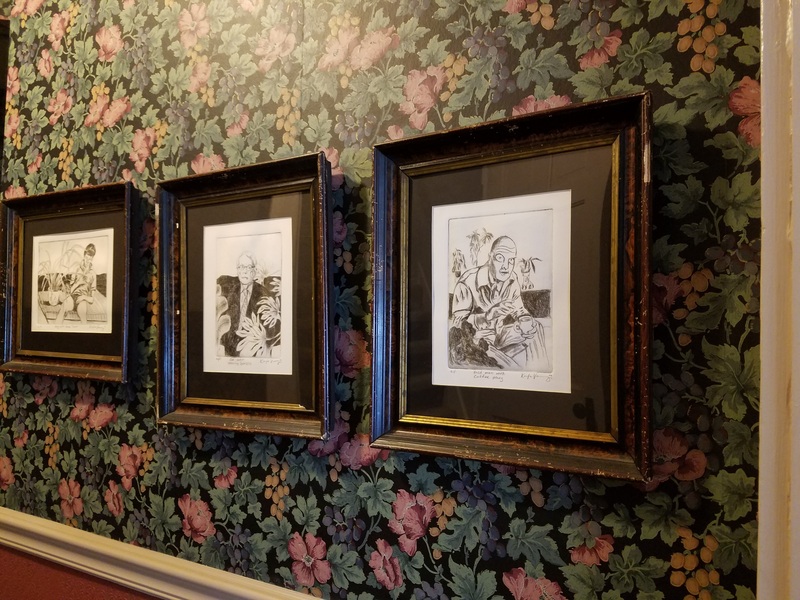 There were individual rooms, all with a story. 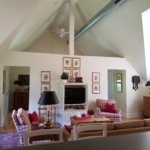 We (I mean, I) sifted through endless photos and descriptions until I settled on the one I wanted – the Live Oak Room. staircase approaching a broad porch and light, airy colored siding. The porches amassed in flowers. that sat overlooking the waterway. It was screened in, so no fear of mosquitoes! There were two rocking chairs where I was able to enjoy a tea first thing in the morning. Andrea told us that we could easily walk to the beach from the inn, so we set out soon after arrival to discover the beach. Much different than what I have experienced during peak season. I imagine most of the people there were locals or retirees, enjoying the setting sun on the beach. We took a long walk admiring the beautiful beachfront home, noting how much cooler the water is than in July! Another problem we often run into while visiting this area is a good place to eat (bet you saw that one coming!). After 29 years, I cannot believe we have never found the place TJ and I stumbled upon – the Brentwood Restaurant & Wine Bistro. 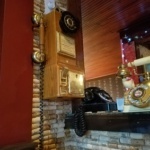 They are on OpenTable (woo – points!) and we were able to make reservations for two last minute. I didn’t know what to expect. Sadly, many places in this area seem great on paper, but they’re overpriced and the quality just isn’t that good. So we were shocked to discover something just the opposite. B&B for fisherman and located across the street. Travelers could pay $1 per night ($.50 extra for breakfast!)! Now, the Brentwood chef, Eric Masson, is serving up phenomenal low country French food that you must try. The inside is quirky and classic at the same time. 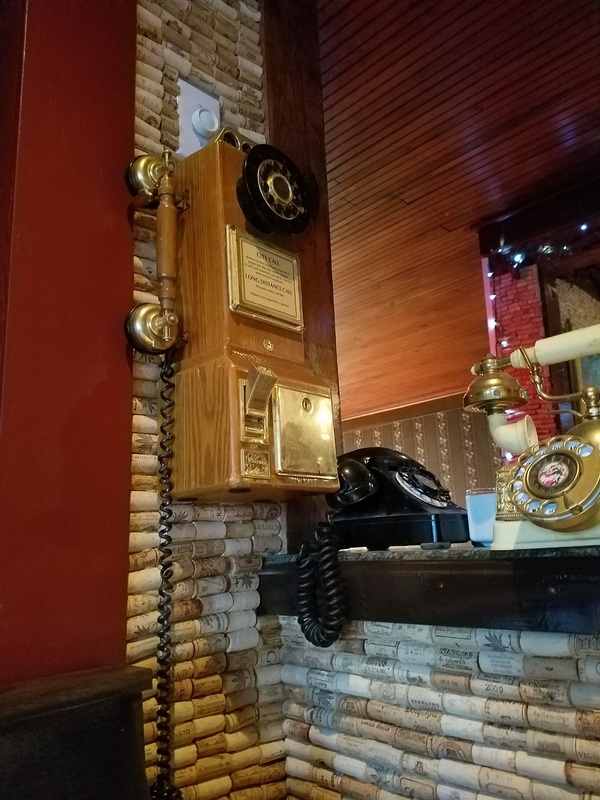 The walls are lined with wine corks and odd pieces of history. Our waiter was from the UK and so fun to interact with. I chose the 4-course Prix Fixe Menu which was a crazy deal ($39)! It included French Onion Soup (one of my all-time favorite things), a House Salad, 6oz Filet Au Poivre and Creme Brulee. I cannot explain to you how ideal this menu was and for $39! you know I’ll be back. TJ chose similar items, but started with the Escargot – a new favorite of his. 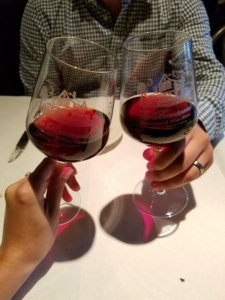 We were able to enjoy a wonderful bottle of wine and the hum of conversation from a packed restaurant. We cannot wait to bring our entire beach house there next summer! OK, so back to the Inn! Sometimes, you end up calling it an early night – French food will do that to you! The Sunset Inn is perfect for just that. With access to movies, a microwave and popcorn, it was a perfect end to a busy day of travel. The following morning, I was up early, ready to get my workout in. The mornings in September are surprisingly cool (unlike July!) and I was able to sneak in a run. I set off down the main road, in search of the end of the island. I came upon a small path tucked away that had a number of piers running to nowhere. (Top picture!) It was a perfect halfway point to reflect and enjoy nature. It’s sad that I won’t have very many opportunities to enjoy The Sunset Inn with a pre-set, annual vacation just up the road, but I certainly hope I’ve convinced you! My guess is that most of their visitors are there for multiple nights, if not an entire week. Sunset Beach is a great vacation spot for couples or small families looking for a quiet, family beach. So with that, my friends… plan a trip to North Carolina’s coast – you won’t be disappointed! If you didn’t know, I’m a small town girl. I was born and raised in Orrville, OH – home of Smucker’s Jelly (or the J.M. Smucker Company if you want to get technical!). I was raised amongst the cows (not really, but there are lots of corn fields! ), without electricity (just kidding, but we were in the middle of Ohio Amish Country) and without a single modern amenity (ha! I did, in fact have a pink, sparkly Nokia in high school). Really, small town life isn’t a whole lot different than city life, except there, everyone knows my family, I can name every single person I graduated with and football & prom are a BIG. DEAL. I moved to Cincinnati 10 years ago and haven’t settled back into small town America since. 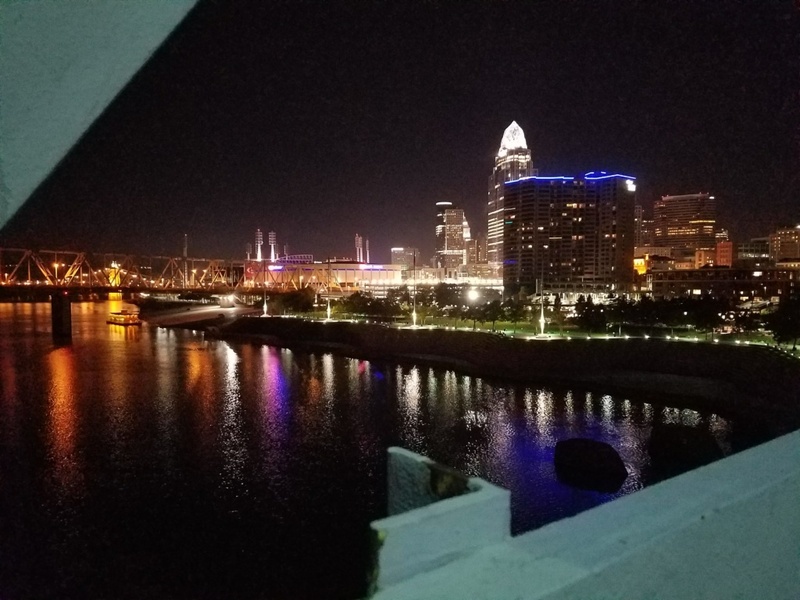 Don’t get me wrong, I loved growing up where I was raised by a community and wouldn’t change it for the world, but there are some pretty cool things about the “city life” that I’ve discovered in my time in Cincinnati and now, Columbus. 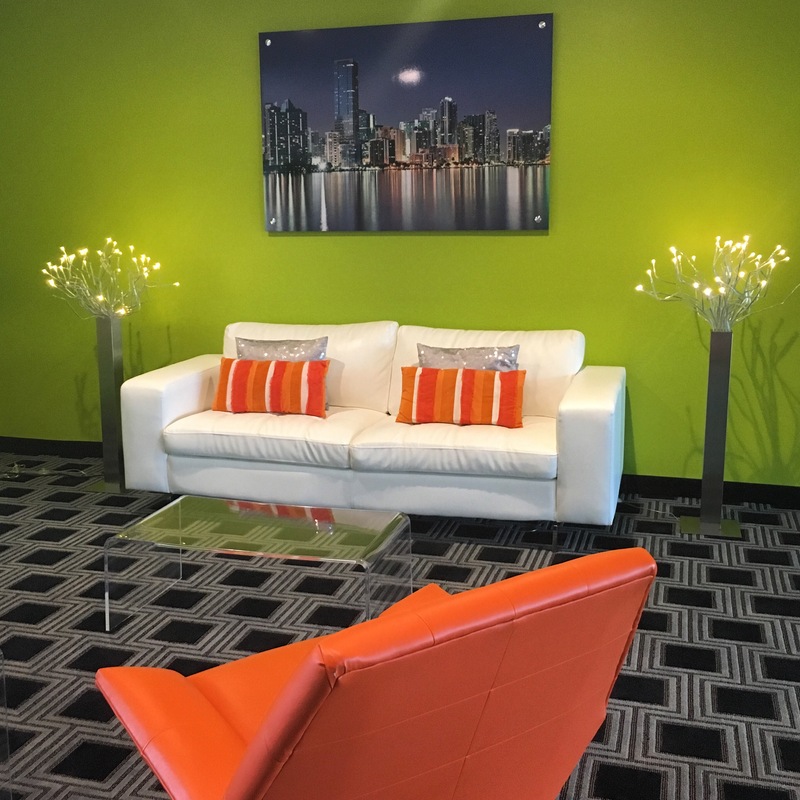 In fact, there’s a lot of cool stuff and what I want to share with you today is how you can enjoy the urban amenities, but feel like you’re in a home-away-from-home with one of these unique lodging properties. an afternoon snooze in the sun filtering through the windows. I live in Columbus, so let’s face it, we all know I have my favorite restaurants. If I were to make a night out of staying at the Victorian Village Guest House, I’d first start with drinks at one of my favorite new places – Mouton, where vintage cocktails are king. Try their version of a Moscow Mule! Next, I would have dinner at one of my favorite Cameron Mitchell Restaurants, Marcella’s in the Short North. If you didn’t know, Happy Hour at Marcella’s is one of the best. You can score half priced drinks and appetizers from 4-6PM (even on Fridays!) After dinner, I’d stroll down to Le Chocoholique, one of my new favorite discoveries. Depending on the time of the year, I’d recommend indulging in one of their hand crafted chocolates or sipping a warm hot chocolate (or both!). would have never guessed had Lynn not shared about some of the permanent guests. Lynn assures me that these life-long residents are there to make guests’ stays enjoyable and playful and mean no harm. 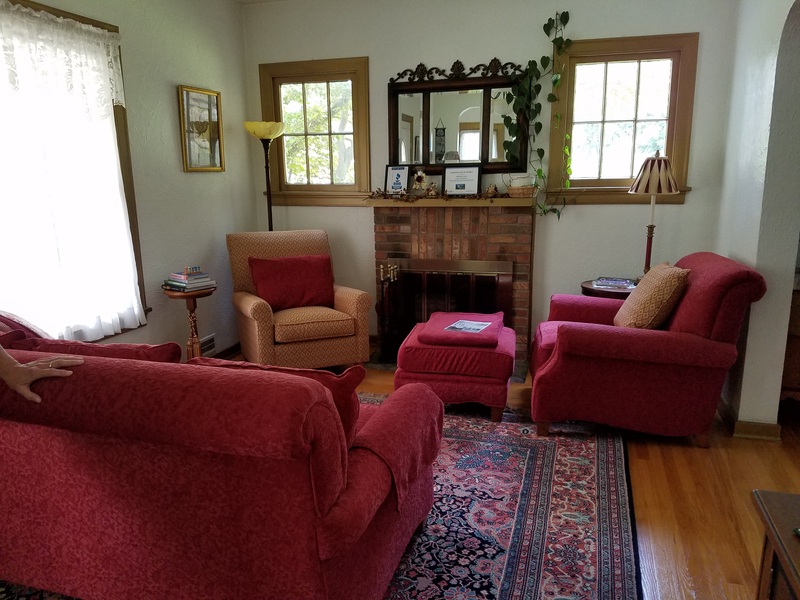 If you’re interested in learning more about the haunted part of the house, Lynn has great stories that would keep you wrapped up by her sitting room fireplace for hours. She welcomes each guest with a glass of wine in the evening and masterfully whips up breakfast in the morning. If you’re staying at Harrison House B&B, I’d recommend a drink at the quirky The Bottle Shop Bar & Market. The bartenders here are mixing up fascinating cocktails, displayed on the menu by date (yes, by date! I’m sensing an historical theme, here!) They have a great patio for the warmer season and food trucks for munchies. If you don’t fill up on food there, I’d recommend checking out The Table. Located just east of High St. on 5th Avenue, The Table isn’t new, but I only discovered it recently. I love their motto, “fork responsibly.” I guarantee anything you sink your fork into here will be delicious. Coincidentally, I noticed that Lynn and the folks at The Table are an example of “great minds think alike” – both want you to know that if you “arrive as a stranger/guest” you will most certainly leave as a friend. 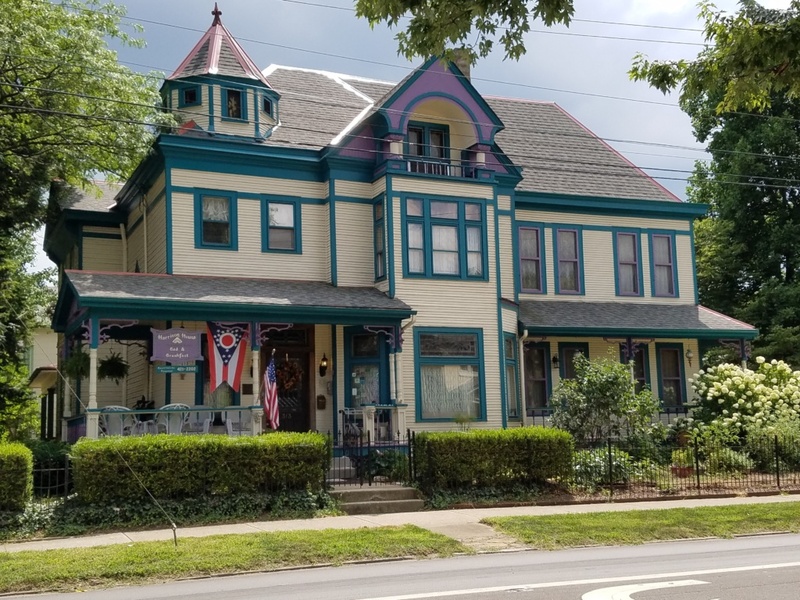 And with that, whether you’re planning your next business trip to Cbus or a night away, know that you have friends in high places with Harrison House B&B and The Table, just awaiting your visit. community living room area, where I could see myself cozied up with a good book and a mug of tea. 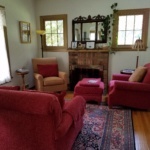 The main house was built in 1920 and has three guestrooms. 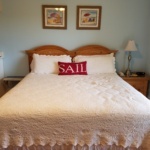 One of these guest rooms, paired with Debbie’s unparalleled hospitality, has at least one regular that stay with her so often, they’re like family! 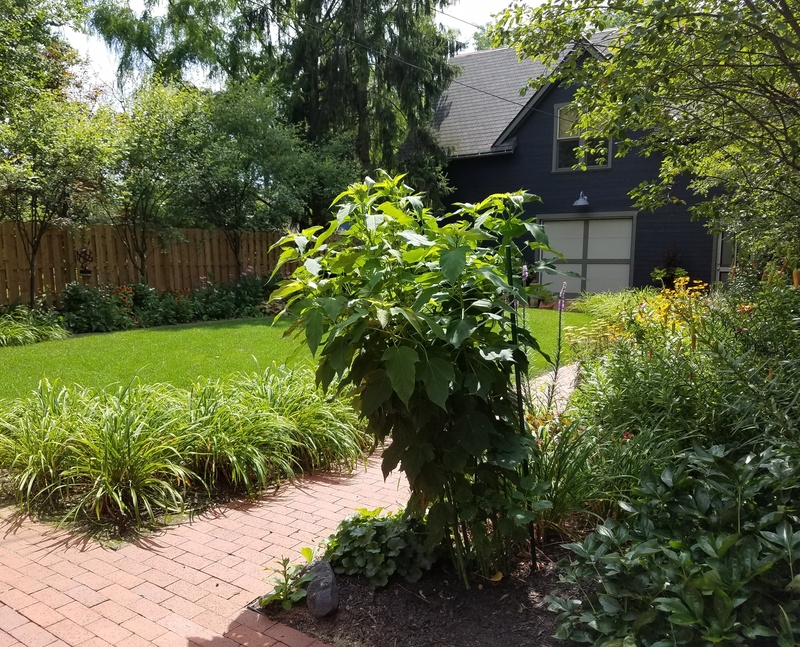 If you take the small path that winds to the carriage house, you’ll find the newest addition to the B&B, the cottage, which is a private room detached from the main house with its own sitting area. 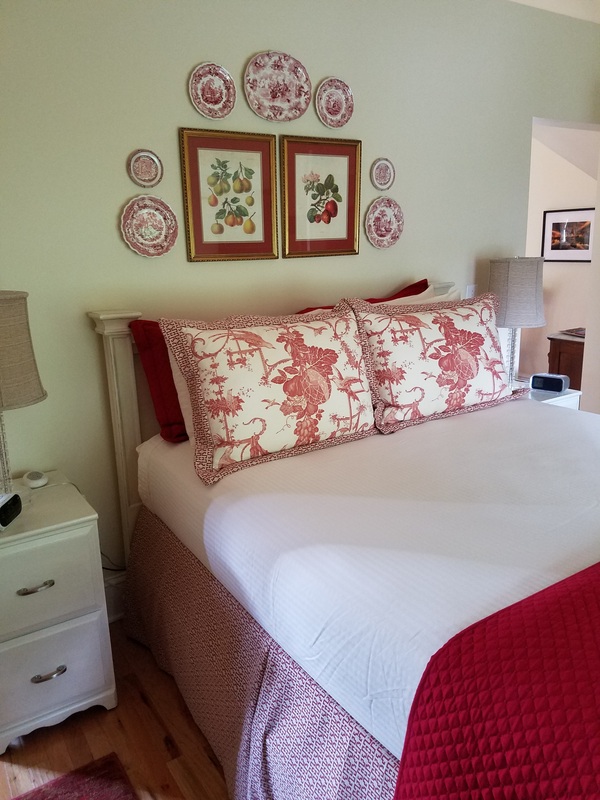 Just above the cottage you’ll find the carriage house room which is where Debbie serves a traditional American breakfast to guests overlooking the meticulously manicured garden. 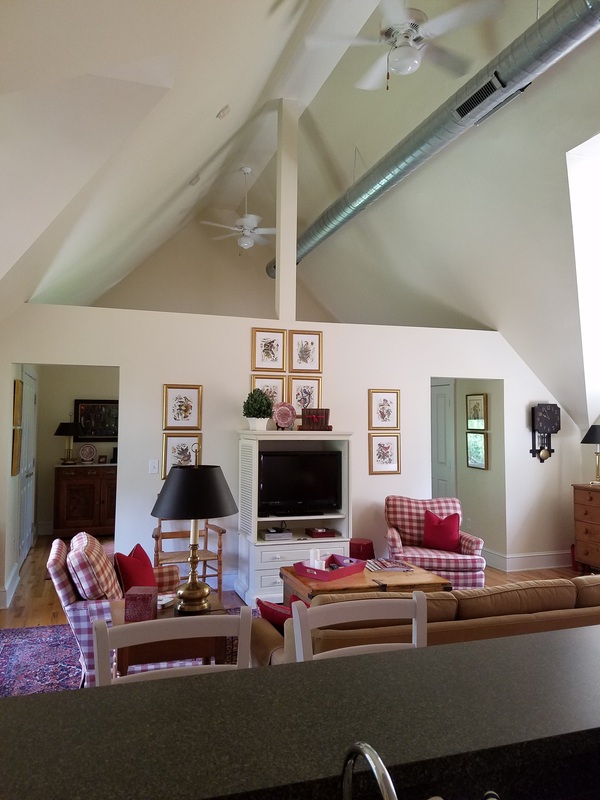 These cottage, the carriage house breakfast area, the main house and the garden are all nestled onto, you guessed it, an acre! 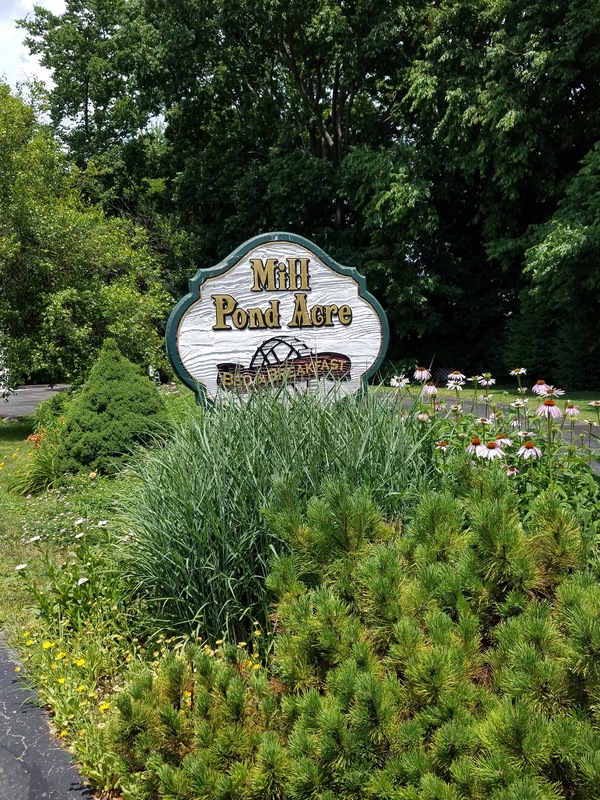 Mill Pond Acre is perfect for those visiting Wright-Patt AFB, The National Museum of the U.S. Air Force, or spending an afternoon visiting all of the shops in downtown Fairborn. Curious about Curio? Explore this Historic Masterpiece with Me! I know, there’s been a lot of hip-hopping around. But, I grew up traveling and there is no stopping me! One of my all time favorite places to visit is the beautiful Blue Ridge Parkway. We have stopped a number of times in the town of Roanoke, Virginia to enjoy its culture and of course, food! More times than I can count, I have stayed at The Hotel Roanoke. There have been some changes though, and I’d say, for the better. 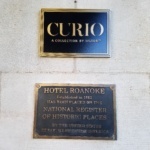 The Hotel Roanoke was built in 1882 by the Norfolk and Western Railroad with an astounding…. 34 rooms. Over the past 134 years, it has continued to serve travelers while expanding and changing. When I first got to know The Hotel Roanoke, I was young and really only cared about their awesome pool in the hot July sun. At the time it was an independent property. 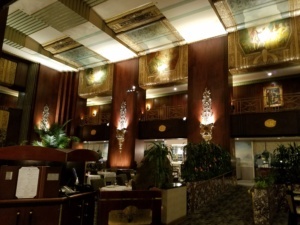 Then, it became part of the Hilton family, where it has stayed for the past 20 years. I started to remember it as “the place with the cookies!” because after all, it was a DoubleTree by Hilton. 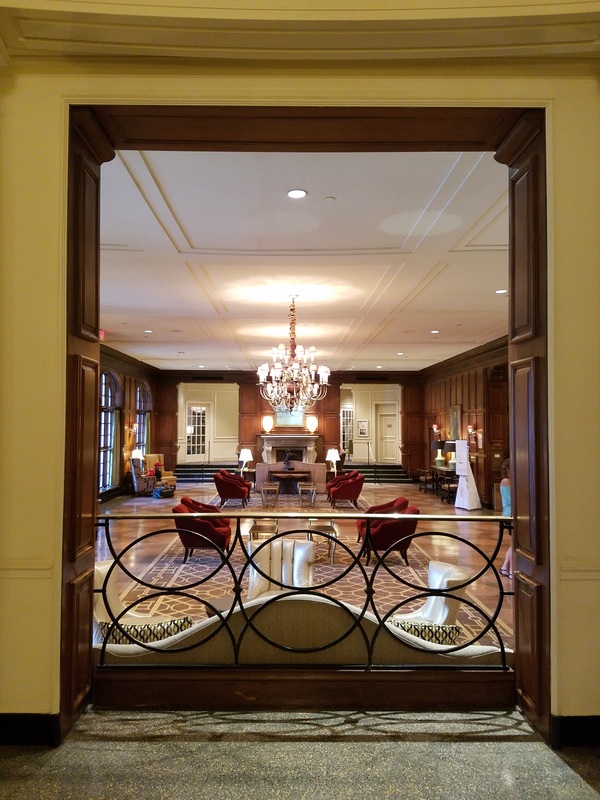 But, I had the chance to revisit The Hotel Roanoke this year and was so happy to see it had (almost) returned to its independent charm. 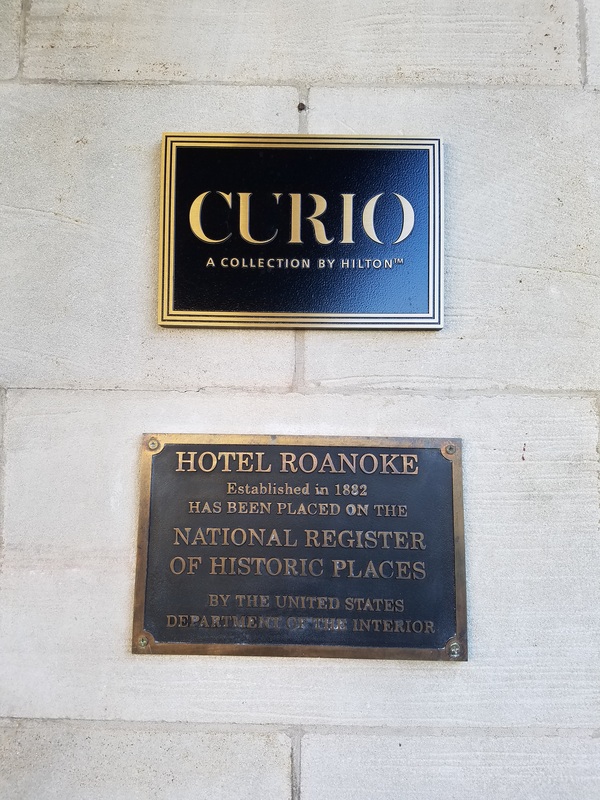 The Hotel Roanoke remains a part of the Hilton family, but has adopted its Curio brand. Curio is Hilton’s version of what we visited a few posts ago in Wytheville, VA (The Bolling Wilson Hotel, an Ascend Collection hotel) – an “independent brand.” In fact, Hilton describes its Curio brand as, “a collection of independent, remarkable hotels whose only unifying characteristic is their glorious individuality.” I think this is a great way for the Hotel Roanoke to mix the standards its guests have come to know through Hilton with its historic individuality. In Ohio, Curio is new to us. 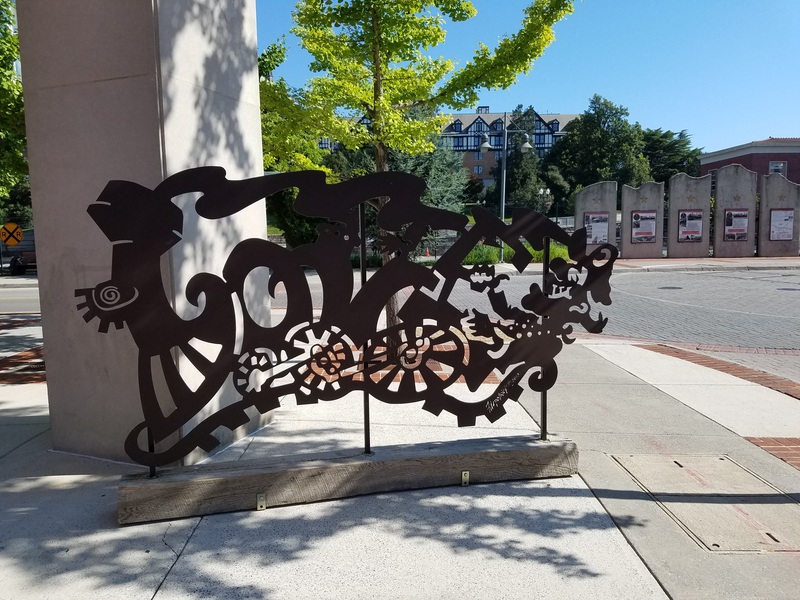 We have a few of them on the horizon in Columbus and around the state, so let’s take a look at what makes Curio…Curio! and comfy places to sit and soak it all in. I loved the added touch for the weary traveler – a table of fruits, snacks and other goodies. This is such a simple addition, but it meant a lot to me after wrapping up a 7-hour car ride. We hurried through check-in so we could maximize the evening sunlight poolside. The pool at The Hotel Roanoke is perfection. There is a poolside bartender, offering up classic cocktails and fun Southern creations. After a few hours enjoying the pool and hot tub, we were ready for dinner. enjoyed most about Fortunato was the mixologists (I’m going to say this, because they didn’t look like your typical bartenders!) were whipping up amazing, clever drinks. 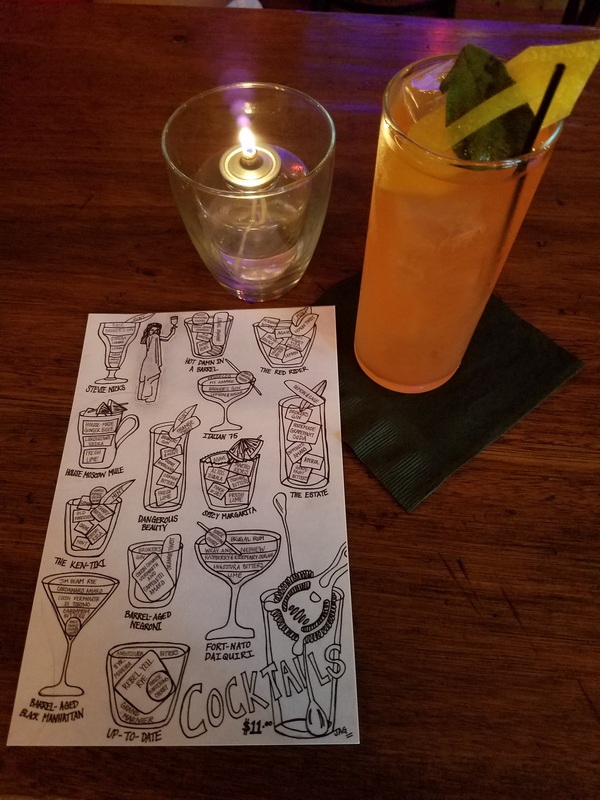 I stole a copy of the creative drink menu the waitress had drawn herself. To me, it screamed coloring page and I can’t wait to put a colored pencil to paper. I tried The Estate which was to-die-for. Eventually, we wrapped up there and ventured down the street to dinner. If you haven’t been to Roanoke, you might not guess that in the evenings there is free entertainment everywhere. This town is literally jamming in every corner of town. Just walking between streets, we heard live music pumping out of open door after open door. But we had a dinner reservation to get to and you know where my priorities lie! So we made it to our restaurant. My mom can take full credit for finding this gem – Lucky. 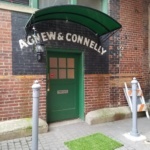 Located in the heart of downtown, this little place was definitely a hot spot. We had reservations, but the owner was sitting in as host and let himself get a little backed up and for good reason. This restaurant was bringing in people from all walks of life. I wouldn’t say this was a hipster hangout or a businessman’s restaurant – they were there to serve everyone Great. Food. We only waited a short bit and he had us seated quickly. We looked at the menu and I felt conflicted. What do you do when you want everything on the menu? Luckily, in the Runion (maiden name!) family, we were raised on ‘don’t duplicate orders at the table.’ We are the sharing sort, passing forks, harmonious “Mmm!”s and comparing notes. Luckily, we did all agree on one thing – we needed that Bread Plate! Packed with goat cheese and olive tapenade. So that’s how our food journey started. Don’t worry, I didn’t completely embarrass myself, I did choose something from the menu. It really wasn’t hard when my eyes finally made it to the last item on the list – Mushrooms and Gnocchi. Because, see, this girl has 2 weaknesses in life: 1) dessert 2) gnocchi. It was amazing. It was a perfect blend of the richness of homemade gnocchi with the earth taste of mushrooms. I was in foodie heaven. If I remember correctly, TJ and my sister ordered the Rib Eye, my dad the Buttermilk Fried Chicken and my mom, the Leaping Water’s Pork Shoulder. Everything was perfect. I can’t remember the owner’s name who greeted us that evening, but thank you! for one of the best dining experiences I’ve had on the road. I think we were truly…Lucky! We made it back to the hotel, just in time to lay weary heads and full bellies to rest, but not before deciding on how and when to tackle breakfast in the morning! Dad and I are the early birds of the group so we agreed to find a good spot before the others woke. So by now, you know when I travel I eat like a king and then run it off in the morning. I do love to discover a new area on foot – it’s really the only way to do it! I laced up my shoes and set out to run to the Roanoke River. Luckily, the City of Roanoke has a ton of great Greenway Trails you can follow. I set out in the early morning sun and headed through downtown to the trail – who do you think I spotted on the way? My dad, walking looking for “good coffee.” (Not to suggest the hotel doesn’t have great coffee, this is just my dad’s ‘thing’) We were able to scout out a few breakfast places including one place that’s been around since 1930 and advertises $.75 coffee & $1.40 hamburgers – The Texas Tavern – Roanoke’s Millionaires Club! We settled on Scrambled which served up all kinds of scrambled egg combinations. We were able to snag a seat outside and enjoyed a delightful breakfast before heading home. you don’t always catch the first time around. 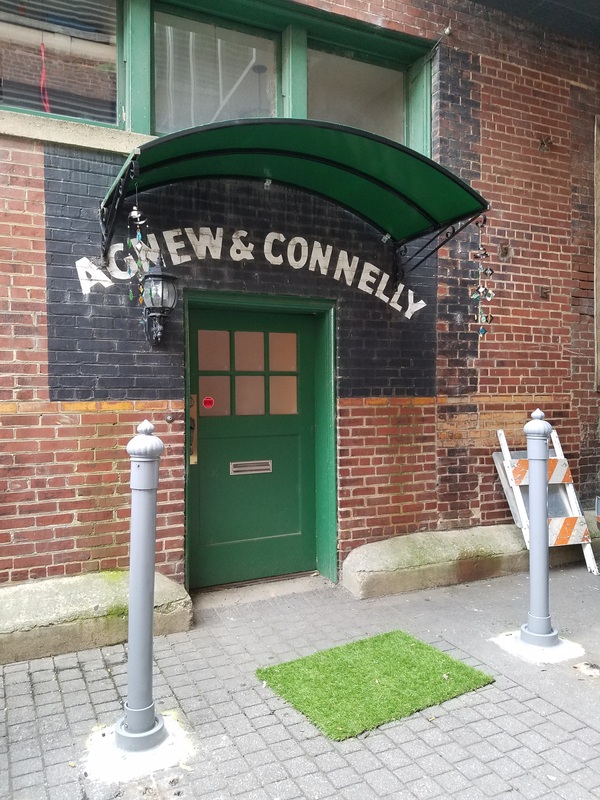 The hidden door in an alley (cool speakeasy? 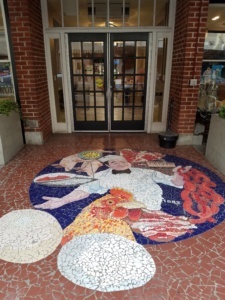 ), the bridges switching back and forth over the railroad tracks, or the chicken mosaic on the sidewalk. Each time we come back, there is always something new to discover. But sometimes, when there is an everchanging landscape, it’s nice to have an old standby that you know will be there year after year in all of its grandeur. 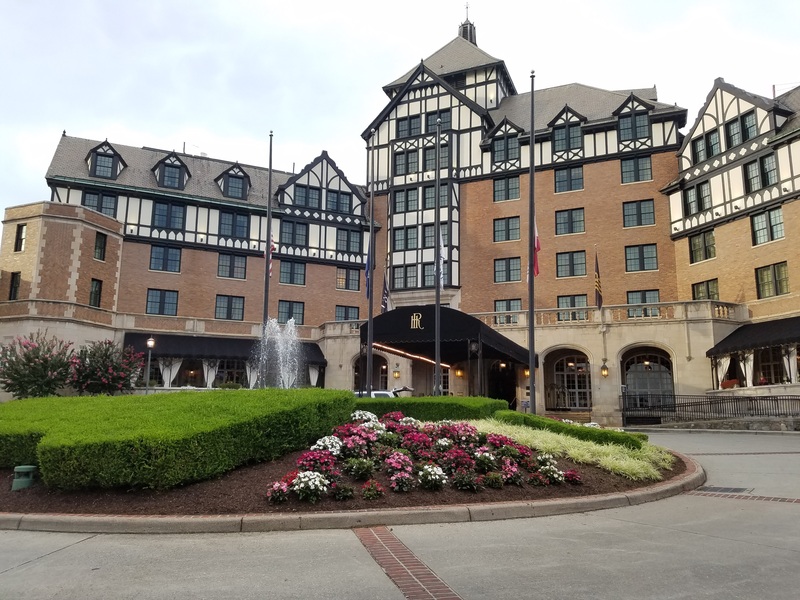 I will always look forward to returning to The Hotel Roanoke & Conference Center and hope you’ll try it too! I’ve never been the girl who loved to write, I was always the girl who loved to read; the one you found curled up with a book in the backseat of the car at night reading a sentence by each passing street light. 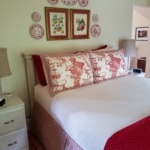 When Halle asked me to “Guest Blog” on Inn Love (which has taken off with fast strides), I admit – I was intimidated. 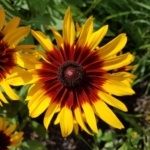 I’m the OHLA staff member you will find as soon as you open the door, where I am planted with a smile. 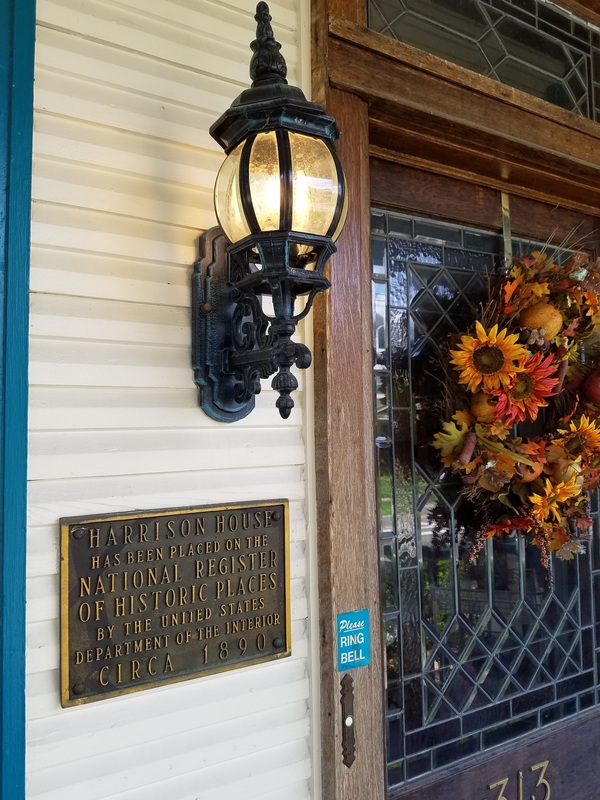 I love to travel but my job doesn’t require as much traveling as the others in the office so I was excited when member hotel property, The Wallhouse Hotel, hosted a Holmes County Chamber of Commerce & Tourism Bureau educational event at their property that was in my area of expertise! 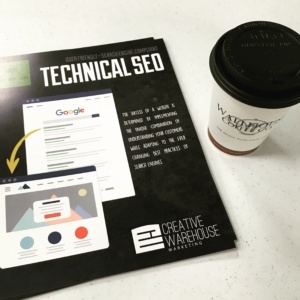 Marketing and SEO’s, yippee. you proceed down these winding roads. We arrived in Walnut Creek and I was in complete shock. The Wallhouse Hotel amidst all of this country land was not what I was picturing AT ALL. It looked like it should be planted in the middle of a downtown city! It was so vibrant with an upscale, sophisticated atmosphere. The lobby was modern and shining with sleek décor and a unique feel all around. 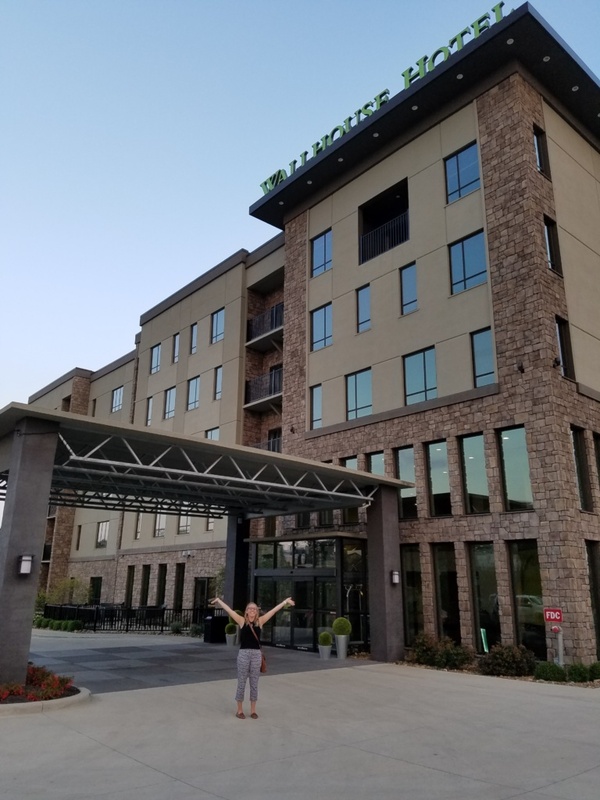 The Wallhouse Hotel is currently the only one of its type, located right in Walnut Creek, OH but they are expanding into new and exciting destinations! 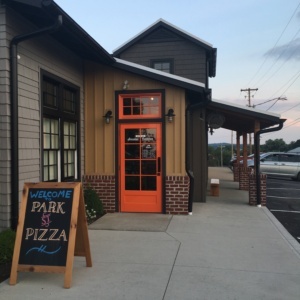 up for filling and heavy home-cooked noodles and mashed potatoes so the staff recommended Park Street Pizza which was just a short drive over to Sugarcreek. The place was absolutely packed! With outside patio seating as well. You go inside and order up front before taking a seat. Now normally when I hear pizza, I am semi-disappointed because being a Gluten-free Girl, not all places have good options — but not at Park Street! We had the option to have any of their woodfired pizza’s on gluten-free crust. Halle and I decided to split the “Greek Town” Salad and the Great White Chicken pizza with gluten-free crust and made our way out to the patio to sit and take in the atmosphere after a long drive. Let me tell you, you will not be disappointed with either of these options! They were fantastic…and I have tried my fair share of not-so-fantastic gluten free options. The crust was a thin, but very good! 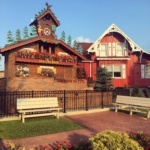 Giant CuckCoo Clock in downtown Sugarcreek! 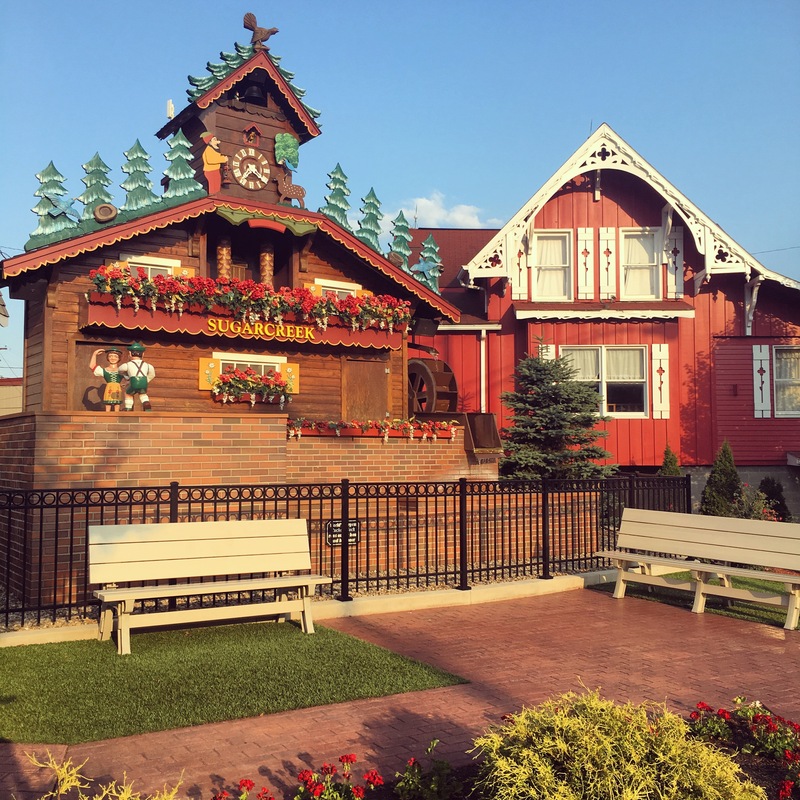 It isn’t only giant, it is the World’s Largest Cuckoo Clock! We got tucked into each of our beds in our spacious, clean suite and read until falling asleep. Bright and early I woke the next day to head down to the basement floor to the fitness center to get my workout in before our E-Marketing Workshop, but not without first taking a step out onto the balcony of our room that faces the most beautiful sunrise over country land as far as you can see. 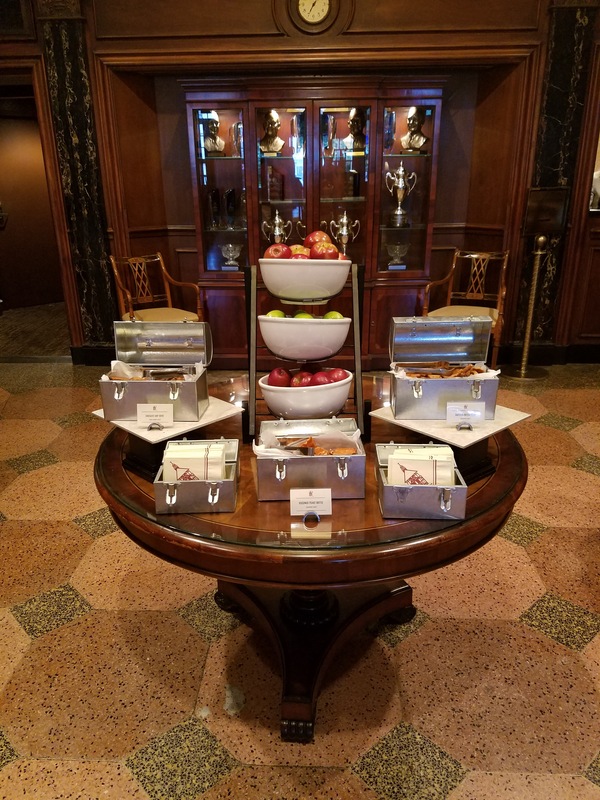 After a quick but sweaty workout, I grabbed an assortment of their complimentary, hot breakfast to take back up to the room while getting ready. The two things I secretly judge a hotel by is the quality of the fitness center and how the breakfast is – both expectations were met at The Wallhouse Hotel! 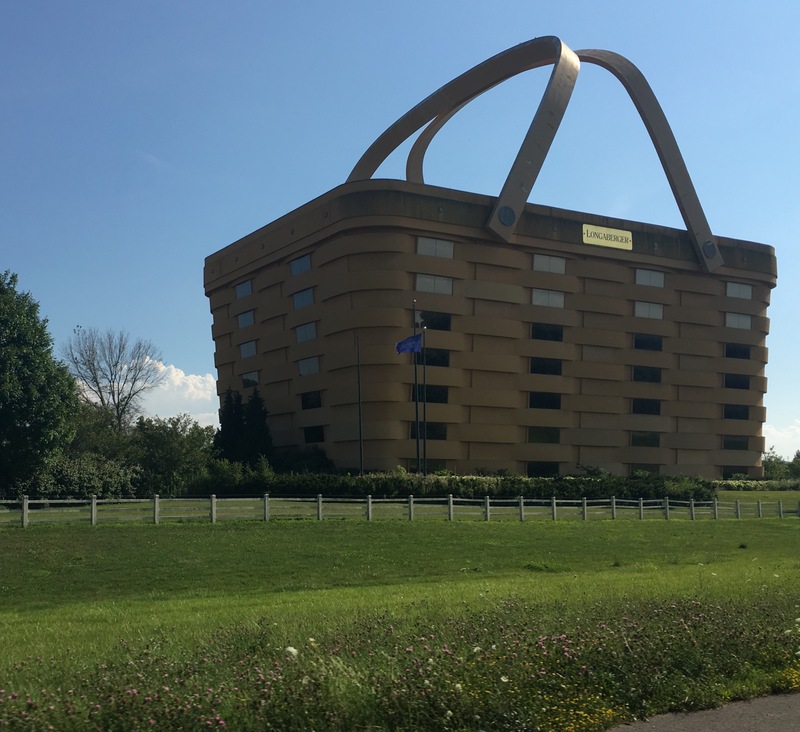 I can’t forget to mention, somewhere in that chain of events, I learned what triple-sheeting was and if you’re a fan of this as Halle is, definitely head over to the The Wallhouse Hotel if not for their unique look and experience but their triple-sheeted beds! and ideas to take back to the office on how to formulate a successful online strategy and some awesome handouts to keep with me to refresh my memory once I returned! 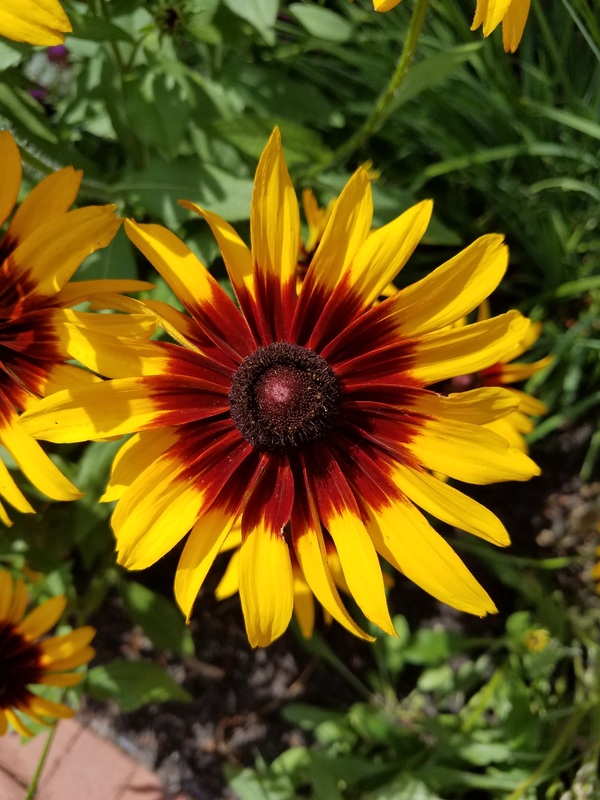 Jordan Mullet with Sandler Sales training laid out some ways to break the rules and close more sales; and Kevin West opened up my eyes to growth and how to make positive changes to help with productivity and success. Overall, it was an enjoyable and refreshing experience at The Wallhouse Hotel. The rooms are immaculate and the space and staff are very engaging with the most welcoming General Manager around. 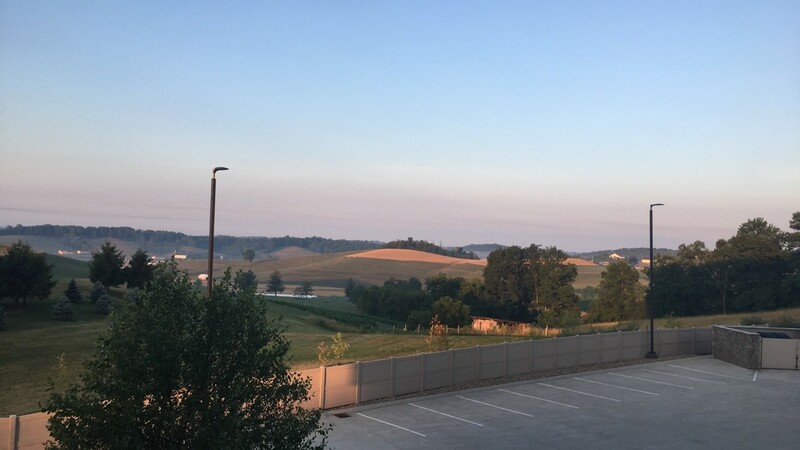 So on your next trip to Ohio’s Amish Country, if you decide you don’t want to stay in your usual spot or want to shake things up a bit, think about staying at The Wallhouse Hotel, you won’t regret it.